Story: How do you know if someone simply loves what they do? Have you ever seen Julia Child's picture? 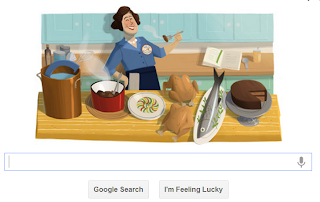 Did you see today's Google doodle celebrating her 100th birthday? Her face (even in the doodle) is lit up by the joy of cooking. Julia and her story is an inspiration to do something that gives you such joy! So I am back to food blogging :-) Today's post is innovative, it brings some health quotient to your everyday bhel and it tastes simply delish with spiced up raw mango. I have fond memories of hogging on this stuff on road-side stalls in India. Last week, I decided to bring back those memories here in Boston.. Recipe: Make tadka in a pan, add mataki sprouts and salt to it and saute for about a minute. Cover and steam for 3-5 minutes till the sprouts are cooked al dente. Rub salt and red chili powder (be liberal with the chili powder) on raw mango pieces. Keep these on the side. In a bowl, mix the cooked sprouts, chivda, finely chopped onion, cilantro leaves, green chilies, half of the raw mango pieces, and lemon juice. That's it - this spice heaven is ready to be served as a snack. Garnish with a few hot mango pieces. Tip: If the raw mango is not sour enough, add lemon juice to the rub as well. I think this dish will be so spicy. I loved the recipe as it tasted authentic and was so simple. Thanks.